One of Nintendo’s major reasons for not supporting HD and keeping the Wii’s specifications conservative was to make it a viable platform for original IPs. The argument was that developing games on machines with multi-core processors and complex architectures was increasing development costs to such a degree, that the appetite for risk was rapidly diminishing within the industry resulting in endless sequels and me-too titles. Two years have passed since the Wii was released and it has since gained many original IPs that allow us to see if Nintendo’s decision has borne fruit, or whether it was just an excuse to limit R&D expenses. Be sure to also check out Part 1 of this series. 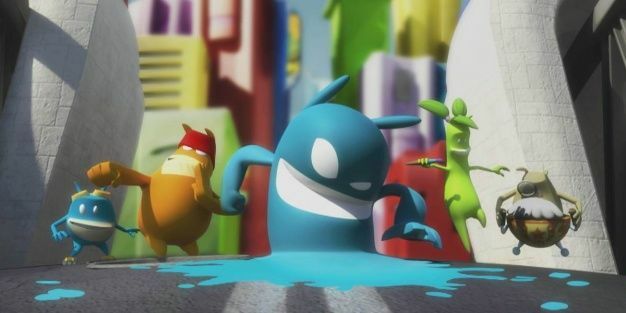 Originally created as a free downloadable pc game, De Blob first came to life in the hands of 8 students from Utrecht University, Netherlands. Publishing giants THQ were so impressed by what they saw, they bought the rights to the game and handed over development to Australian outfit Blue Tongue Entertainment. Despite slow initial sales in Europe and the U.S., THQ has come to regard De Blob as a critical and commercial success. Its sales are likely to close in on the important 400,000 mark through the holidays, and should easily exceed half a million going into next year. LittleBigPlanet and De Blob show that the platformer isn’t dead just yet. The strongest indicator that No More Heroes is a sales success is that a sequel is on its way – Desperate Struggle. It also serves as the strongest lesson on why sales for Wii games should not be judged solely on their opening week, something Suda himself learned much to his relief. Even now, judging No More Heroes is difficult to say the least: how much should an ultra-violent, cel shaded, censored (in Europe), technically challenged, flawed masterpiece sell exactly? Enough to warrant a sequel and keep its developer in business, that’s how much. While obviously a port of a PS2 game, Okami’s inclusion on this list is justified by its sad legacy. This was the game that may have finally caused Capcom to terminate Clover Studios, despite their work on some of the finest games of the previous generation. Okami was to be Capcom’s attempt to take Nintendo’s Legend of Zelda series head on. Critically the game succeeded beyond all expectations, with many reviewers rating it higher than Nintendo’s epic. At retail however Okami didn’t even begin to approach the sales of Twilight Princess, selling a total of 270,00 copies in the U.S.
Capcom handed over the reigns to the talented Ready at Dawn for the Wii port, but with a limited budget and schedule that ultimately did not allow the developer to add any additional content. Despite this, Capcom revealed that the game had sold 280,000 copies worldwide a mere 4 months after its release, bringing it approximately in line with PS2 sales. While it could be argued that the PS2 version of Okami had a greater amount of competition at the time, it also strongly confirms the existence of Wii gamers hungry for high quality, original content. Overall though, the case for a game like Okami is not strengthened even with the additional Wii sales – a port got the go ahead, but a sequel never will. While there have been reports of some WiiWare games selling only in their hundreds, two of the best original games released on the platform have found success. LostWinds, released in May ’08, has sold over 268,000 copies – significant success for a game developed by a small team in a matter of months. Frontier boss Braben has spoken in glowing terms about the project and has confirmed a sequel is on the way. World of Goo, despite piracy rates of 90% on the PC, has found an audience on WiiWare with sales of 44,000 in th U.S. after only being on sale a month. Arguably the best game WiiWare has to offer, World of Goo should go on to match LostWinds success after its European release and holiday sales. Encouragingly for 3rd Parties, Nintendo doesn’t have the stranglehold on the WiiWare market that it does on traditional software. So where does this leave developers when it comes to original IPs on the Wii? The only million seller on the list is Red Steel – a big-budget game that was heavily advertised and most likely needed its large sales to cover its development costs. The rest have sold (or look likely to sell) between 400,000 – 750,000 across their lifetime, figures that neatly match up to the benchmark that Reggie used during E3 ’08 when taking about successful 3rd party Wii games. WiiWare has also proved to be a strong platform for original content and not just a crutch for shovelware as many had feared. The ability to turn a profit from original Wii games is evident, the biggest hurdle seems to be the runaway success of ports and mini-game collections that require fewer development resources and time to create. Why put enormous effort into a sequel to Zack & Wiki when a Zombie-lite port of Dead Rising from the 360 will likely make more money? Despite this looming question, a large number of developers have taken up the gautlet with titles like Little King’s Story, The Conduit, MadWord, Deadly Creatures and Arc Rise Fantasia.